High Palms: What's your Hair-O-Scope? Do you ever wonder what your horoscope says about your hair? Or do you want to know what brilliant tips suit your hair the most? I tell you what, the wait is over! To help you stay fearless, get your hands on hair color that adds depth and dimension, whether you’re brunette, blonde, or auburn. Use your determination and grow those locks long. Your office strut will be that much more powerful. Or, try something new and unexpected with an asymmetrical bob just try to resist trimming it back to even layers at home. I couldn't agree more than this! Yes, i am truly a perfectionist. I want every single thing of my hair to be perfect, and sometimes that makes me feel afraid to try something new. But these suggestions really help! Asymmetrical bob? Will be on my next list! And i also love how they encourage me to grow long locks because that's what i'd love to! Want to know yours? 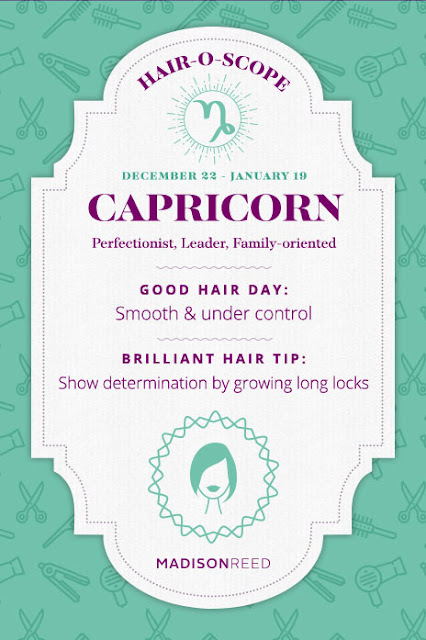 Find your Hair-O-Scope by simply clicking this link. Madison Reed also has made a Hair Color Quiz on their website. There will be 8 simple questions and once you have answered it all, you'll get the most suitable solution to your hair! Feel free to check it out here. Madison Reed is a hair color company that aims to give girls healthier and professional-grade hair color at home. It provides the home-coloring experience with vibrant & salon-quality results. With its free of harsh chemicals & natural nutrients, you will certainly have a good hair day, everyday.